Renownly one of the most renown locations the world over. Ground floor: There is a large entry and storage room with a washing machineand wine cabinet. First floor: There are two comfortable sitting rooms equipped with old style forniture, comfortable sofa and armchairs, Satellite TV and stereo. A dining room that can seat twelve, a fully equipped kitchen with dishwasher, and a bathroom with shower and tub. Second floor: On the top floor there are three double bedrooms with twin beds and three double bedrooms with canopy beds . Bthrooms ensuite for each room with shower. The amenities include: dishwasher, washing machine, toaster, Satellite TV, hairdryer, iron and ironing board, filter and Italian coffee pots. Dinner services are available (with advance notice). Cooking lessons are also available (with advance notice). The heating is independent by floor. In the big garden area you will find a ni e infinity pool facing the vineyards of the property and the typical tuscan landscape with rolling hills and woods. 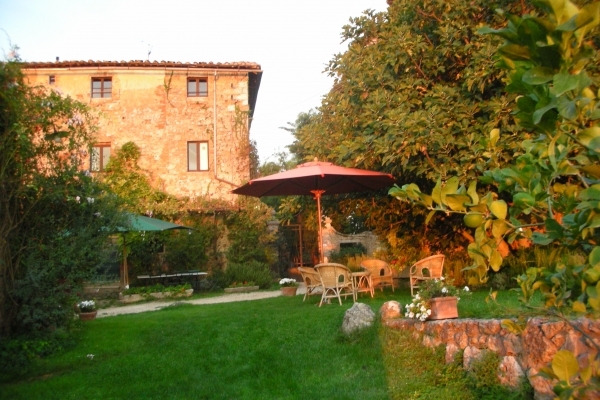 Sun beds, marbel table, bbq, table tennis, bikes, bocci ball court and all is needed to enjoy a perfect relaxed day under the tuscan saun.